capsule (gelatin [bovine], , glycerin, and purified water), proprietary antioxidant blend (consisting of rosemary extract and natural tocopherols), and natural lemon flavor. As a dietary supplement, take one (1) softgel a day with meals. 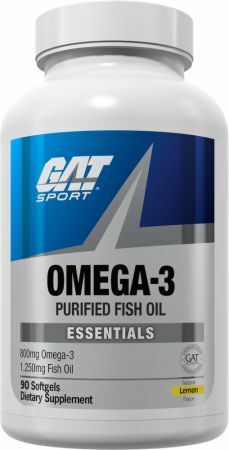 GAT Sport Omega-3 delivers 800mg of Omega-3 fatty acids. It is well known Omega-3s are great for heart health for everyone. But for competitive athletes the benefits of Omega-3s go so much further. Omega-3 fatty acids may boost overall health, reduce inflammation and offer performance-enhancing benefits for athletes. * GAT Sport Omega 3 includes natural lemon flavor for great taste, and purified to eliminate heavy metals.